With sports performance technology growing rapidly, there are many unknowns to be explored for coaches and athletic trainers. For Kurtis Ashcroft, a young and innovative Athletic Trainer, sports performance technology has helped him immensely during his time with the Glasgow Rocks basketball team. In partnership with Athlete Focused who he works with, he&apos;s leveraged insights from the Athos Training System to help players stay ready to perform at their best on game day. Kurtis took a chance on using Athos Training System and has since used the insights to identify which players on his squad need attention as well as provide a deep analysis of what the issue is that needs to be addressed. Providing in-depth analysis to the athletic trainers and coaches has helped to create individualized programming in an effort to keep the best players ready to perform. Learn more about how Kurtis used Athos below. What’s your background in sports performance? My dad was my coach in Judo and Freestyle Wrestling from a very young age and I competed internationally. I planned to be in the sports scene for my whole life. My passion for sport blossomed into learning the scientific principles behind it. From there, I earned a diploma in Sports Science. My parents and tutor pushed me forward to pursue University. I studied physiology and sports science at the University of Glasgow. I’ve now been here for five years and I&apos;m taking on a Ph.D. in Physiology and Sports Science. During this time of being a student, I’ve done intern work for a professional football team in Scotland here at the SPFL. I also was an intern for the under 20 Scotland Rugby team and travelled to the U20 World Cup which was held in Manchester. My main role involved GPS analysis, but I also assisted in the gym and recovery protocols. Why are you so passionate about sports performance technology? I like the idea of creating visual representation of data it collects. It’s also a third eye on the players. Not only does this increase player motivation, but helps the coach identify some aspects of performance which can’t be seen by the eye. It can also elucidate underlying issues with the players. For instance, one of the guys had a sore leg and the data itself helped to validate that. It’s another way of helping ensure that the players are getting enough stimulus for adaptation while helping prevent them from overtraining. By looking at longitudinal data we can also determine points at which players break. So it certainly helps in future to prevent hitting those breaking points, again. How did you first find out about Athos? Funny enough it was on Forbes. I was just scrolling through the internet; I think it was when I was doing my undergrad. It was around two years ago when I first saw the word “Athos.” I was researching wearable technology for my undergrad project and I saw that this was one of the most revered companies in this space over in the San Francisco Bay Area. During the initial stages of my Ph.D., I was looking for a product that included accelerometers and heart rate monitors to help strengthen my thesis and Athos popped into my head. What sets Athos apart from the rest of the technology in this space? I like that it’s both internal and external metrics. We know from the literature that one measure is not enough, you need both. The idea that you can measure the internal stress of muscles and can compare that to accelerometer (motion) data, all within the same data set, is pretty awesome. It can really help us with player feedback and feedback to the coach for certain variables, such as intensity. What are the benefits of knowing muscular stress? Monitoring Muscular Stress identifies how physiologically demanding the session was for the athlete. It also allows me to identify player breaking points. Unfortunately, this often means an injury has to occur to prevent re-injury in future. Nevertheless, using those breaking points and Tim Gabbett’s acute: chronic stress ratio, permits injury risk monitoring. Thus, improving longevity for some players. Especially for some of our older players who perhaps cannot withstand the same amount of stress as a younger player. 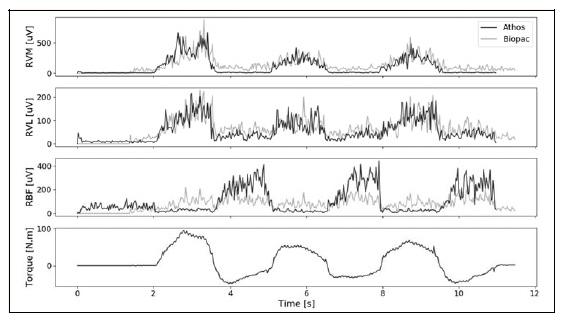 You can also investigate the intensity of the sessions and contrast this with muscular stress. For instance, one of our players might experience much more muscular stress compared to the other players. I prepare and relay this information to the coach. The coach can say, "ok so he’s sitting out of this drill because it’s harder than x drill, while others guys continue this drill." Why is it helpful to have Athos pinpoint which athlete needs attention and why? It&apos;s helpful to have Athos pinpoint which athlete needs attention because we need every player ready to play. Professional sports often have a fast player turnover rate, so if we can prevent players from becoming overtrained, injured and fatigued, or determine those who require medical attention, will effectively augment player readiness and longevity. Ultimately, the data aids to achieve and maintain optimal performance. We want them to perform as long as possible, individually and as a team. We can look at the Athos data in a traffic light manner where a player is green, yellow or red. Then once we’ve identified an underlying issue we can take that a step further and look at it from a medical standpoint, if required. It’s the fine balance of ensuring the player receives enough stimulus for adaptation, yet not too much. How can Athos be used for Return To Play? I have used it as a Return to Play mechanism. But actually, if you go back a step further, the Athos Training System helped to identify one of our players (Ali) who was overcompensating with his left leg. He actually had an inflamed bursae in his right ankle near the Achilles. We found that over time, Ali was overcompensating on his left side for every session. He then started to complain of soreness in his left ankle. The data helped to validate that issue. Ali has a very strong left bias. This data illustrates overcompensation on the left leg due to an extremely inflamed bursae in the right ankle. I took it to the coach and said he really needs medical support with this, he’s had inflamed bursae before and is playing through a lot of pain. The coach said, “why should he if he’s been playing absolutely fine?” Together, we were able to discuss how Ali had been playing through a lot of pain, and as a result, his left ankle was getting sore due to the overcompensation. He’s in the rehabilitation process at the moment and I’m able to identify in the gym the balanced load on his left and his right during double and single leg exercises. I compare the load that he’s applied on his right leg compared to the left. I break his data down over time and ensure his load is sufficiently increasing. Simultaneously, I contrast his data with his subjective measures, such as wellness and RPE to check he is able to tolerate this increased load. All being said, we don’t know what’s around the corner during a rehabilitation process, and this positive linear progression isn’t always the case. Athos can also measure the contribution of the muscles during each exercise, which no other product can really provide at the moment. We can check for muscular asymmetries during a rehab protocol, which might indicate a protective mechanism to an injured site. We then implement pre/rehab protocols to facilitate with balancing these muscular contribution ratios, thus ensuring adequate antagonistic muscle pairing. What decisions have you made using Athos metrics? The example above is a great one. The fact that Athos basically helped validate the reason for Ali to receive the medical attention and then measure the progression of intensity of his sessions over time. Another example is where the coach was implementing certain drills during a session and was hoping to attain a certain intensity from that. However, post-session the data established that they didn’t match the intensity we were wanting. We are able to break the drills down into intensity classifications. We implement these drills into sessions from a tactical periodization perspective, and the data helps justify use of certain drills during our sessions. We programme to elicit a very high intensity for the first few days of the week and then taper down for gameday. We modify this dynamic process depending on where gameday falls within the week. Looking at the gym based data, I would implement programs for power and programs for strength or a mixture (complex training). I’ll use the load each exercise inflicts on the players to manipulate how the week looks in the gym. For instance, if we have a double-header on a Saturday and a Sunday, and we’re gyming Tuesday, Thursday and maybe Friday, then I’d find what exercises cause the greatest amount of muscular stress which shapes our exercise format during the week. The week could start with a strength session and finish with power based exercises toward the end of the week, priming the athletes for game day. What have you learned by having your athletes wear Athos in the game? Something very interesting that we found using the external and internal loads which the Athos Training System provides, was based on playing positions. We’re able to see that our center forward, who has the lesser motion load (movement on the court) compared to our point guard, who has the most motion load, actually experiences more physiological stress on his body. This figure displays Kieron and Jonny&apos;s data standardized for playing minutes during game play. Overall Jonny has a greater average motion load. However, Kieron&apos;s muscular stress is greater than Jonny&apos;s.
It could be hypothesised Kieron experiences more physical contact in the post position. We find that really interesting. Thus, we’re receiving internal data based on different playing positions. For instance, we can look back at that data and say that Kieron (Center) who has played 20 minutes, in comparison to our point guard who also played 20 minutes, that Kieron endures more muscular stress, and that’s simply because he’s always battling in that position. So we need to take into consideration the varied effects of different playing positions on each player. This can determine individual training and recovery strategies post-game. What are examples of some recommendations you’ve made from Athos data? Kieron was been complaining of very tight hamstrings, which was going on for around three weeks. We couldn’t really understand what the underlying issues were. The data came back, and Athos’ Applied Sports Scientist helped to provide an Anterior to Posterior Ratio. This showed us that Kieron was totally out of the norms and actually had a greater anterior contribution to posterior. He is highly anterior dominant, so he always inflicts more stress on his quads, we can also see this in the breakdown of the muscle contribution. Ali has a very strong left bias. This data illustrates overcompensation on the left leg dues to extremely inflamed bursae in the right ankle. For this reason, we speculated that his quads were getting tight. From there, I was able to recommend that he do specific exercises to help relieve the tightness he felt. I gave him a prehab program to help balance out this ratio and activate his posterior chain through certain glute and hamstring exercises, like the RDL (Romanian Deadlift), back extension exercises, and arabesque stretch. How do you get the athletes to buy into using the technology? Initially, I thought of head figures. Kieron is our captain, I can create stories that relate to him, which I’ve already done through this, by showing him his A:P ratio. Kieron is one of our veterans so you can imagine that if he’s on board that some of these younger guys will basically do what he does and what he says. Above that, I’ve started to win the coach over. I give him as much feedback from what I have initially and I then ask for his feedback from what I’ve given him, which was 5*. Coach sets the scene, the culture. If the coach is not receiving the data, that’s on the players. They will get strikes, before they get fined fined for forgetting their Athos kit. It’s given them a sense of accountability. I also try to relay as much information on demand, to the coach. I try to give him individualized feedback from the data and I can do this immediately post-training by using the individual feedback screen on their phones. 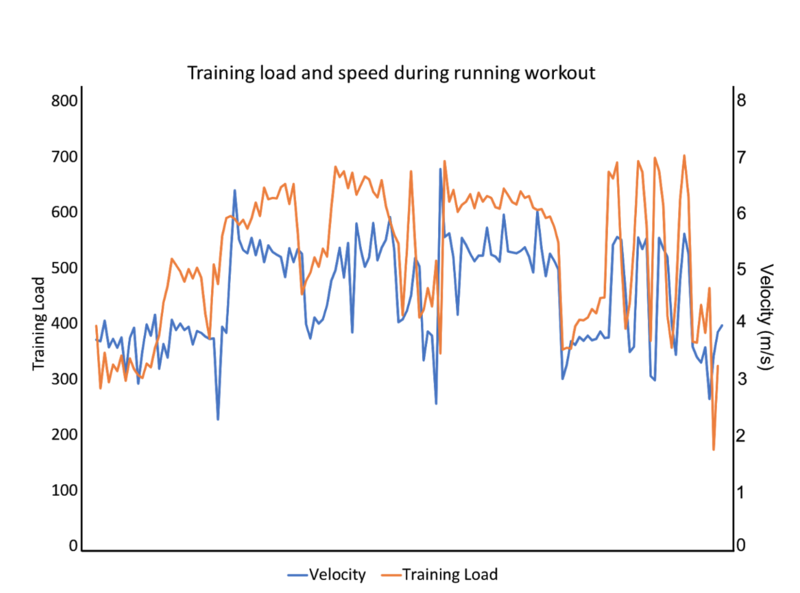 Thereafter, I create graphs from the raw data to illustrate their intensity and muscle contribution work. They enjoy the interactive style between themselves and live output from the product. So that really does help with the adherence to the protocol. When I saw that you can do an exercise and see which muscle is being used most and that’s using your traffic light system, so you’ve got your yellow amber and red. When I was doing my squat I was like “wow” I’m definitely over-activating my quads, yet I’m not activating my glutes enough. That kind of was my wow moment. Why do you think sEMG hasn’t become mainstream yet? If I’m being honest, from a scientific point of view, I’d say a lot of sports scientist worry they’re measuring false data. A scientist, straight off the bat, will turn to the literature and look for a validation study on the product. With something so new like Athos, there’s not a lot of scientific literature on itself. So, I feel that comes first. If you push validation and reliability of the product to show it measures what it sets out to measure, and with precision. Then, I feel that a lot of the sports industry, specifically sports scientists, will refer to that literature and ultimately feel more comfortable to use the product. What do you see in the future for sports and technology? Perhaps, I like the concept of a one fits all model. So, a bit like Athos, that also has the ability to measure heart rate. Heart rate, muscular stress and accelerometer data, are three main metrics we really like to investigate during and after a training session. With an additional system that could measure distance and speed, would also be advantageous. If that information were on demand, on iPads for each player, then that’s something that I can see flourishing. It might sound silly, but a little like playing FIFA, where each player has a bar starting at 100% fresh. As the session or game progresses, we can watch that bar deteriorate depending on the individual physical levels. What would you tell someone who’s resistant to using tech in sports? I’d say try it yourself first of all. If you’re a coach, player, S&C coach or a sports scientist, just give it a bash. You don’t know what you’re going to get out of it. I see it as a product that you can use for immediate feedback from a beginner right through to an advanced level. So I don’t really see why anyone would resist trying the product. What would you love to see improve or advance quicker in this space? A live feedback mechanism which gives you data that you can interpret and make decisions from, in real-time. What I mean by that, is that we’re looking at percentages. If you have thresholds using those percentages, then we can use that during the training sessions, rather than waiting to see the data post exercise. If you could collect data on something else in a practice or game what would it be and why? Fatigue index. I now that heart rate follows the same principles where you’ve got zones, so you’re looking at five zones from light to max heart rate. If we could implement, for instance, sEMG and have percentages for muscular stress, then that could be a marker of fatigue during the game or session. I think that could be really useful for sports where you have rolling subs, like hockey and basketball. Thus, we could get the best out of players. An example might be that we observe a player’s heart rate is in the 95% zone for x amount of time, while simultaneously his fatigue level from his sEMG Muscular Stress is rapidly increasing. Then we have to sub him to the bench and get the most out of another player. If you&apos;d like to learn more about Athos, please click here.